Dad’s words have come back to me numerous times over the years. I don’t clear fields with explosives but I am in the business of dealing with problems that sit like stumps in the fields of people’s lives. Feeling “stumped” is still a figure of speech that takes us back to a time when real stumps stopped progress and required creative solutions. Nowadays, the stumps of life take the form of difficult people standing defiantly in our path. Or maybe we pause in front of a moral or ethical stump in the road. Or our movement is abruptly halted by a stumpy disagreement with a loved one or colleague. These metaphorical stumps create as negative a consequences as the literal stumps of by gone days. They thwart plans, decrease productivity, and generally frustrate us from achieving our goals. Eradicating the stumps of life by force is always a temptation. When I was younger, I was more willing to tolerate the drama inherent with an explosion. As I have gotten older I realize that aggressive solutions can leave even more problems in their aftermath. The price of blowing up a stump of life can be measured in terms of the flying shrapnel and collateral damage in the aftermath. The stump may be gone but the mess still has to be cleaned up. If I choose to figuratively blow up a person or problem I must judiciously count the cost. Will the blow up damage relationships or a reputation that I value? If I will lose more than I will gain with the dynamite, I should consider the “plow around it” approach. The great World War II commander, George S. Patton understood the wisdom of going around costly and unnecessary battles on his way to bigger objectives. As the Third Army rolled toward Berlin in 1945, his tank commanders regularly employed the tactic “bypass and haul…” Well, you know the rest of that quote. 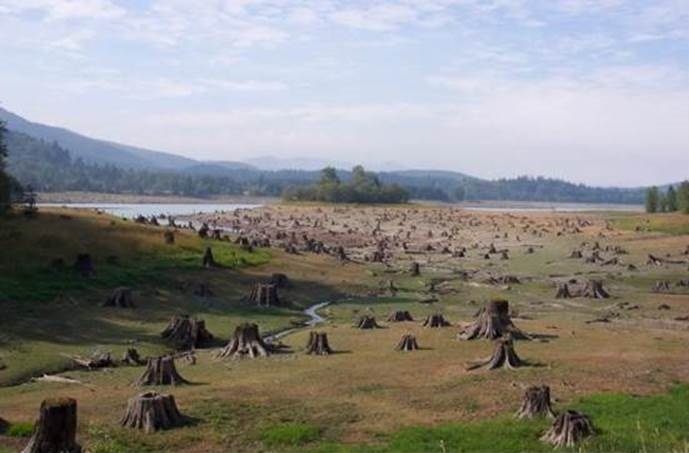 Sometimes the stumps of life are better left to rot out on their own. Time and decay will eventually eliminate even the most gnarly stump. Choosing to plow around the stumps of life requires patience and restraint. Just as blowing-it-up has a cost, the bypass-it solution also comes with a price tag. The ground controlled by the stump is always unproductive. You can’t harvest hay or grain on a stump. And it isn’t just the actual above-the-ground stump that is a problem. The root bound area around the stump is also unavailable to till or plant. The same predicament exists with the stumps of life. Those people or problems or philosophies that we leave in the ground will diminish the productivity of everyone or everything around them. If you choose to detour around the stump, just remember it will still be there the next time you go to the field. If you can live with that, make a wide turn and don’t look back. But, since it is fortnight, you are allowed to hop up and dance on that stump. You can figure out what to do with it on Monday.